Type the famous honey bee is Apis dorsata produces honey and forest produce honey Apis mellifera cattle. Honeybees Apias millifera types can produce honey, bee pollen, royal jelly and propolis in high enough quantities each year. Honey bee Apis mellifera type often called Italian honeybees. Honeybees are very major ones as the honey bee farm in Europe, America, and Australia. Now almost all the worldwide beekeeping bees Apis mellifera using dikarenkan able to produce the amount of 200 kg of honey per year perkoloni. Honeybees are more easily farmed, its docile and easy to adapt to the environment so that the bee species is not easy to leave the nest. Breeders will feed the bees follow the types of flowers as a source of feed and produce honey based sources such interest. In Java beekeeper bees could graze on the estate Kapuk, Mango, Rambutan, Longan, Duwet and Rubber. The role of honey bees as pollinators of interest is very large, so it is reliable farmers to help improve agricultural production and plantation. Always live in colonies of honey bees, the average range of 60-70 thousand bee colonies in one hive. Although the population so dense, the bees are able to do their work in a planned and well-organized. A bee colony generally consists of worker bees, males and queens. Arguably the worker bees in a hive do the whole job is making a nest, cleaning the nest, guarding the nest, feed the larvae and queen bees, and the main thing is to collect honey and bee pollen as seumber feed. Queen bees have a greater body weight and weight of 2.8 times the worker bees. Each bee colony there is one queen bee in a colony if there are two queen bee then they will kill each other for position as our mendapatka queen bee. Queen bee in charge and keeping bees in a colony keharmonis. All the bees in a colony will partner to obey the queen bee, queen bees go wherever then a colony of bees will follow. 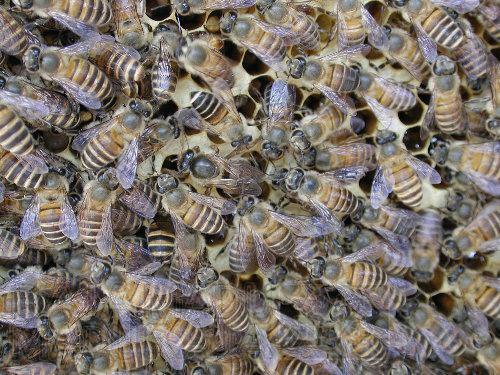 In addition to leading the bee colony, the queen bee has a responsibility to continue the survival of the bee colony by laying eggs throughout her life. Queen bee can lay 1500-2000 grain setipa day. Queen bee has a longer life than the worker bees. Worker bees was about 40 days but the queen bee can live up to 3-5 years or about 30x longer than worker bees. Secrets of lasting much longer queen bee queen bee is due to take Royal Jelly throughout her life. While the worker bees consume only royal jelly for 3 days at the time into larvae. Drones have physical properties that are smaller than the queen bee but larger than worker bees. Cirri stands out is her large. Eyes were composed of facets that more than eye facets of worker bees and queen bees. Male bees have no suction pipe honey and pollen pockets have no feet. So that drones are not in charge of collecting pollen or honey, drones just cleaning the nest, keeping the nest and light duty lainuya. The main function of the male bees are marrying the Queen Bee. Ordinary worker bees also known as female bees, bees that have these job responsibilities throughout his life. Body size ketch more worker bees and queen bees than drones. Slender body shape and tail brownish black color has a straight, barbed stinger. With the sting to protect the hive by worker bees and attack anyone who interfere. Worker bees have the job responsibilities of different compatible with the age of the worker bees. Shortly after coming out of the cocoon of direct worker bee larvae have a responsibility to clean the hive of dirt, when 3-10 days old worker bees produce Royal Jelly is indispensable bee larvae and queen bees. Royal jelly is produced young bee after bee consumes honey and bee pollen. Royal jelly from bee glands located around the neck of the bee. Young bees are then in charge of feeding the larvae and queen bees. Note Queen Bee Royal Jelly consume all his life. After the worker bees around 3 weeks old, the bees have a new job that is tasked with finding out srangnya nectar flowers that will be processed into honey and flower pollen that is processed into bee pollen. Bees fly search for pollen and honey to descend a thousand flowers that are broke. Bee sucking nectar with a drop of hisapnya and store honey in the bag that is in adalam body.